If you’re looking for the perfect Broadbeach family accommodation then you’ve found it right here at Sandpiper Beachfront Apartments. Located on the Gold Coast, just ten minutes away from Surfers Paradise, you don’t have to go far to keep the family busy and entertained. With the beach just across Old Burleigh Road, there are two areas of beach that are patrolled 365 days a year. Surfing enthusiasts take heart, there is usually a swell worth riding on Broadbeach. Check the daily surf report for conditions. Across the road is a superb park with BBQs and plenty of space for the whole family to play, whether it’s a game of beach cricket, volleyball or throwing the frisbee around. Broadbeach is also a great land-based location for whale-watching from June to November. With a choice of one or two fully self-contained bedroom apartments, they are all ocean facing, most with spectacular sea views looking out from their private balconies. The two bedroom options have full laundry facilities, which is essential for families taking longer holidays for their Gold Coast theme park experience. Other families may also want to extend their visit to take advantage of the excellent shopping nearby. Whether it’s to shop your favorite brand in one place at Pacific Fair Shopping Centre or to scoop a trolley of bargains at the brand direct outlets at Harbour Town Shopping Centre, Sandpiper Beachfront Apartments are an excellent accommodation choice and just ten minutes from either shopping centre. The next time you are looking for family accommodation at Broadbeach , Sandpiper Beachfront Apartments will make you feel most welcome. The range of facilities both within the apartment complex (think large heated pool and spa), and locally (you really don’t have to cook if you don’t want to, with a staggering number of eateries nearby), not to mention the parks and easy access to the beach. 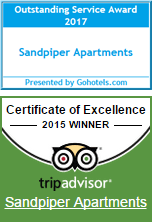 All these things make Sandpiper Beachfront Apartments a favourite amongst families looking for Broadbeach family accommodation. Call or book now for an unforgettable family holiday at Broadbeach on the Gold Coast.